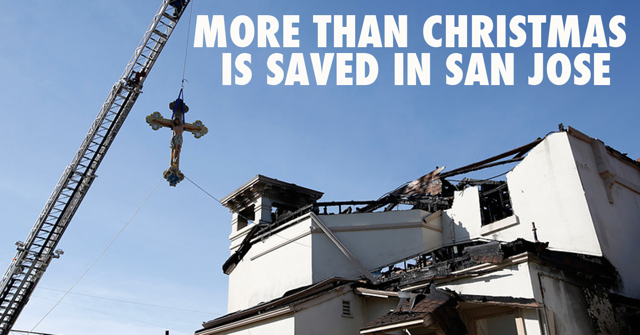 Saving Christmas took on a joyful new meaning in San Jose, California, the morning after a devastating fire turned historic Holy Cross Church into a burned-out shell. "The Rev. Firmo Mantovani and bleary-eyed members of his parish were stunned," writes Jose Rodriguez for the San Jose Mercury News, by a "wondrous sight." "I can't believe what I'm seeing," said 86-year-old parishioner Sam Arlotta. "Milagro!" added Cecilia Calderon, using the Spanish word for miracle. "God loves us very much." With Christmas only weeks away and Kirk Cameron's movie "Saving Christmas" playing only 15 minutes away at the Century 20 Oakridge theater on Blossom Hill Road, parishioners had wondered what the Yuletide had in store for them. "Standing on Jackson Street in the city's Northside neighborhood, they gazed through a fence and the open front doors at the heavy, 10-foot-tall, Italian-made gilded wooden crucifix that somehow survived the four-alarm fire Sunday afternoon," writes Rodriguez. "Like Arlotta and Calderon, Mantovani figured the crucifix and everything else inside the century-old church had been incinerated. San Jose fire Battalion Chief Richard Toledo couldn't explain it either. "I wish I could tell you," he told Rodriguez. "It was open to all of the elements -- the fire and smoke and the collapsing roof, and yet it's there in almost perfect shape." Cause of the fire remains unknown, but removing the historic crucifix, the fire chief called in a crew trained to use ropes in human rescue situations. As a grateful pastor and prayerful parishioners watched, "firefighters carefully probed the charred beams holding up the cross," reports Rodriguez. "A lone firefighter lowered a special rope from a tall fire engine ladder into the gaping hole above the altar and crucifix. Firefighters below carefully fastened the rope around the arms of the image of Jesus." And they lowered the antique cross to the ground. Parishioner Tino Quinones was astonished. "It doesn't look like he has any damage. It's amazing!" The church was founded more than a century ago to serve Italian immigrants. "The dollar amount for damages to the church -- which was insured -- was anybody's guess Monday," reported Rodriguez. In joyful tears, parishioner Dorothy Bua approached Mantovani. "Is there anything we can do you for you, Father?" He answered, "I am fine. "Just keep up the spirit." And that's exactly the message of Cameron's movie -- now playing in theaters nationwide. CLICK HERE for times and theaters near you. Wisemen at the U.S. Postal Service!